Just to let you know – there’s a link to a free (and brilliant) ebook at the bottom of this piece. When I’m not elbow-deep in the early modern, I work on the side as a tour guide, bringing nice people (like you) on walking tours of Cambridge. It’s not a bad job, combining my deep attachment to history with my love of jokes and shouting. 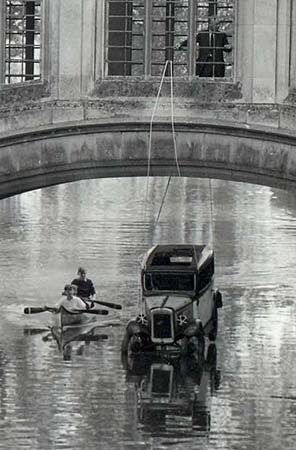 Tour groups always like hearing about student pranks, of which Cambridge has plenty – the most famous include the 1958 incident in which a group of engineers from Gonville & Caius managed to get a fully-constructed Austin 7 van onto the top of the Senate House, and the (apparently multiple) occasions on which resourceful students have used punts and ingenuity to hang a car from the Bridge of Sighs at St. John’s College. There is, however, one special kind of student prank that I love to tell people about. I think it might be because it seems to encapsulate the extremes of ‘work hard, play hard’ you see in this city. Less a real prank than a clandestine activity, I’m talking about nightclimbing. Night climbing is pretty much exactly what it sounds like. It involves heading out under cover of darkness and negotiating the walls and roofs of Cambridge’s colleges and great buildings. The pinnacle of the nightclimber’s career has to be the ascent of King’s College Chapel – a masterpiece of Tudor propaganda, home of stunning stained glass, bearer of the largest fan-vaulted ceiling in the world and, crucially, very bloody high. In my first term at Cambridge, I remember looking up in December and seeing Santa hats on all four spires, because there’s no point making it that far and not leaving something to show you did. Since it was first published in 1937, the nightclimbers’ bible has been Whipplesnaith’s ‘The Night Climbers of Cambridge’. It offers a view of Cambridge like no other, taking you out of the streets and across the rooftops, risking Senate House Leap (the gap between Caius and the Senate House, over the street some forty or so feet below) and ascending all the way to the top of King’s, where they’ll need to hire a steeplejack to remove the traces of your adventure. You can find out more about Whipplesnaith’s magnum opus at this helpful blog, but if you’ve got a Kindle you’re in even more luck: I’ve been informed by the very knowledgeable @CamTourGuide (give ’em a follow on Twitter!) that Night Climbers is available as a free Kindle download at Amazon this weekend. I’ve just got my copy and might even post some choice directions here. So follow this link, get reading, and I’ll meet you atop Great St. Mary’s. PS I see elsewhere (on Liberal Nation) that Whipplesnaith – whose real name was Noel Howard Symington – went on to rather dodgy things, standing for election as a Mosleyite candidate and penning another book, the significantly less attractive Return to Responsibility: A New Concept of the Case for Fascism in the Post-War World. Should have stuck to rooftops, really.